The current spell of warm weather has been great for reptiles, and reptile surveys, which are undoubtedly enjoying the long sunny days. Reptiles are cold blooded and need to increase their body temperature in order to feed which is achieved through basking in direct sunlight or sheltering under refuges, which serve as an aid to absorbing heat. 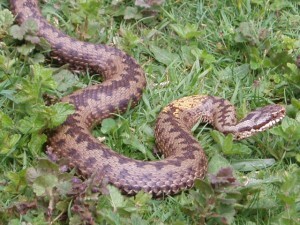 Presence/absence reptile surveys can be carried out as a method of determining if a site is in use by reptiles. In addition to direct observation, squares of roofing felt are commonly used as suitable refugia and any reptiles observed are recorded. With all this warm weather, particularly in the south-east of England, reptile survey visits are having to be made earlier in the day when the temperatures are low enough to spot them (under current survey guidelines issued by Froglife (1999). Reptile surveys are best carried out when temperatures are between 9°C and 18°C). All British reptiles are afforded protection against killing and injury under Schedule 5 of the Wildlife & Countryside Act 1981 (as amended). Rarer species including sand lizard and smooth snake receive additional protection under The Conservation of Habitats and Species Regulations 2010 (as amended) which affords protection to both the species and their habitat.